While popular in certain circles, the .45-70 Government cartridge does not get a lot of attention these days. The .45-70 delivers bone-crushing power at close range, but is difficult to shoot accurately at longer ranges because its big, slow-moving bullets have a steep trajectory. While the .45-70 is relatively popular among black-powder silhouette shooters and among those who hunt big game in heavy cover, only a relatively small percentage of hunters utilize it. Designed in 1873 for use in the "Trapdoor" Springfield, the .45-70 (originally known as the .45-70-405) fired a 405 grain, .45 caliber bullet propelled by 70 grains of black powder. This original black powder load pushed a cast lead bullet at a velocity of about 1,350 feet per second. With a muzzle energy of about 1,600 foot pounds, this cartridge was one of the most powerful loads available at the time and was effectively used by the Army through the Indian Wars in the late 1800s. The Army continued to use this rifle and cartridge in limited numbers through the Spanish-American War and Philippine Insurrection in the late 1800s and early 1900s. 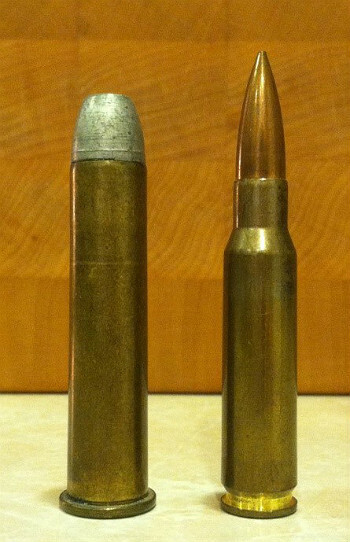 A .45-70 with a 350gr cast lead bullet (left) compared to a 7.62x51mm (.308 Winchester) cartridge. Due to excellent the reputation it earned while in use with the Army, the .45-70 quickly became popular among sportsmen in the United States. In response to significant demand for good rifles chambered in the cartridge, major manufacturers began building rifles specifically for the .45-70. Soon, hunters had access to quality rifles and repeaters such as the Remington Rolling Block, the Remington-Keene, the Sharps 1874 "Buffalo Rifle," the Winchester-Hotchkiss, Winchester Model 1885 "High Wall," and the Winchester Model 1886. Even when using the relatively simple, solid lead bullets available at the time, the .45-70 was an extremely potent load when used on deer and black bear and still effective on the larger, tougher and sometimes more dangerous species like moose, grizzly bear and buffalo. Using modern, smokeless powder, most of the ammunition manufacturers currently produce a wide variety of loads of varying power for the .45-70. What load you should use depends on the rifle you intend to use it in. If you have an older rifle such as a vintage Trapdoor Springfield or a Winchester Model 1886, then you should stick to low-pressure loads that mimic the original performance characteristics of the round. However, most modern rifles, such as the Marlin Model 1895, the Ruger Number 1 or a converted Siamese Mauser, can handle increased pressures and there are several loads in production that have significantly improved the performance of the original black powder load. As just a small sample of these improved modern loads, Federal Premium ammunition makes a load firing a 300gr Trophy Bonded Bear Claw at 1850 feet per second, generating a 2,280 foot pounds of energy at the muzzle. Hornady produces the "LEVERevolution," which has a pointed, flexible, polymer tip which improves the ballistic coefficient of the normally flat tipped bullet. 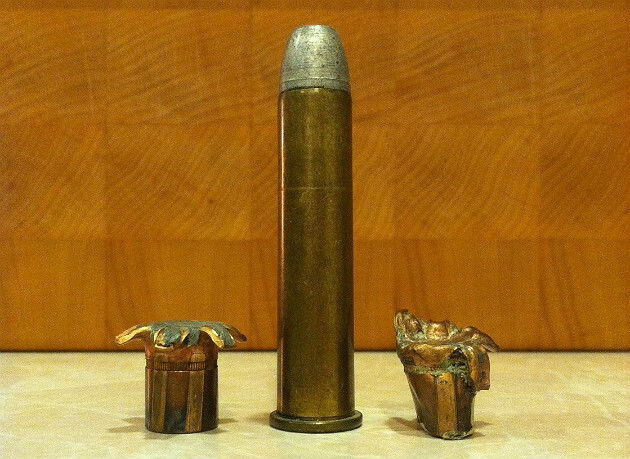 The 325gr bullet has an advertised muzzle velocity of 2,050 feet per second and a muzzle energy of 3,032 foot pounds. Buffalo Bore produces one of the hottest .45-70 loads available with a 405gr jacketed flat point bullet propelled at 2,000 feet per second for a tooth rattling 3,597 foot pounds of muzzle energy. Combined with modern bullet construction, these enhanced loads dramatically improve the performance of the .45-70 on virtually all game species when compared to the original black powder load. This allows the hunter to ethically take game at longer ranges and still consistently penetrate deep enough to reach the vitals of an animal for a quick and ethical kill. While the .45-70 is a very accurate round, it is difficult to shoot at longer ranges because the slow velocity and low ballistic coefficient of the bullet combine to produce a pretty steep trajectory. At ranges past about 200 yards, precise range estimation and applying the proper hold over become extremely important. For instance, using the ballistics of the original black powder .45-70 load, a bullet will drop nearly 50 inches between 350 and 400 yards! For this reason, long-range shooters using cartridges like the .45-70, such as buffalo hunters back in the late 1800s, used "tang" or "ladder" sights with Vernier scales that allowed for precise elevation adjustments. As long as he estimated the range correctly, a skilled marksman using a high-quality rifle and sight could accurately hit targets out past 1,000 yards using the .45-70. 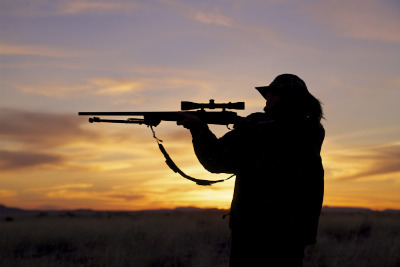 Due to these constraints, few modern hunters use the .45-70 at ranges past 200 yards. Fortunately, this cartridge excels at short ranges where the heavy, slow-moving bullets deliver the bone-crushing power and deep penetration necessary for hunting large, tough animals such as moose and grizzly bear. At the same time, the low-velocity bullets do not produce large amounts of ruined, blood shot meat on thin-skinned animals such as deer that high velocity cartridges do. Another advantage of the .45-70 is that most of the rifles chambered for the cartridge are short-barreled lever-action rifles like the Marlin Model 1895. These rifles are often easy to carry, whether on foot or on horseback, and are quick to mount and fire. For these reasons, the .45-70 is an ideal cartridge for hunting in thick woods or heavy cover where short-range shots (less than 100 yards) are common. 300gr Nosler Partitions retrieved from a feral hog (left) and a red hartebeest (right). In addition to use on North American game, the .45-70 can also be an effective cartridge for an African safari. While not well suited for the longer range shots that are sometimes encountered in areas like the Kalahari Desert or Serengeti Plain, the .45-70 shines when taking shots in the thick bushy conditions often encountered in the Lowveld or Mopani Bush areas common in many parts of Africa. Using high-quality bullets, there is no plains game animal that I would hesitate to use the .45-70 on at short range. Even large animals like the eland should present no problems as long as a heavy-for-caliber, controlled expansion bullet is used and placed appropriately. While I'm sure it has been done before, I would be cautious about using the .45-70 on thick-skinned dangerous game like buffalo and elephant. For one thing, even when using very high-pressure loads designed for modern rifles, the cartridge only produces between 3,000 and 3,600 foot pounds of energy at the muzzle, which falls short of the legal minimum energy requirement of some countries for use on dangerous game. Additionally, at .204, .238, and .276 respectively, the 300, 350 and 405gr bullets most commonly used in .45-70 fall short of the commonly recommended minimum sectional density of .300 to reliably penetrate deep enough to reach the vitals on a buffalo or elephant. As a remnant from a bygone age in American history, there are few other cartridges that have as long and storied of a history as the .45-70. While it certainly has its limitations, the .45-70 is still an extremely effective cartridge when used under the proper conditions. There are few modern cartridges that can match balance of power and portability that the .45-70 offers.